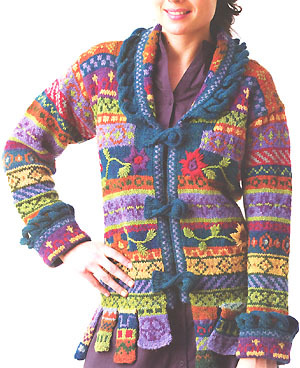 This wonderful jacket is knit using Jamieson's Shetland Heather Aran 100% wool yarn and is from the book Knitting Beyond the Edge by Nicky Epstein. Yarn kits for the jacket are detailed below. The pattern is not included in the kit but is from the book Knitting Beyond the Edge by Nicky Epstein which must be purchased separately.